Have you seen any of the incarnations of Bruce Lee’s last, uncompleted film, The Game of Death? Note: My favorite is A Warrior’s Journey, directed by John Little. 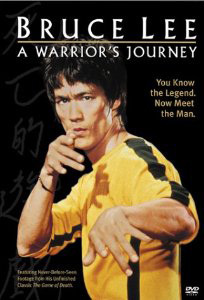 In the movie, Bruce Lee has to fight a different martial artist from a different style, at each level of the temple, trying to make his way to the top. Each level really does represent a different style, not like some of the movies that claim to show different systems, but they all end up looking like karate. For a minute, I want you to imagine that you are the one progressing up the floors to the top. You are going to have to fight grapplers, Filipino artists, masters of Hapkido, and so forth. There are different ways for you to approach this challenge. Which is right for you? 2. You could follow Bruce Lee’s most basic advice and avoid playing the other person’s game. In other words, don’t grapple a grappler, don’t try high kicks against a Tae Kwon Do expert, and so on. Baffle your opponent and defeat him with what you know will counter his system. 3. Most people think that Bruce Lee played the other person’s game in The Game of Death. They thought that he was stick fighting the stick artist, that he pulled out nunchaku, when the opponent did, he grappled the grappler etc. They thought that he was proving that he had mastered each style better than the masters whom he fought. 4. Personally, I have another theory: I think that Bruce Lee showed that he borrowed little bits from each style, and they permeated his entire repertoire of martial arts. In other words, he fought them within each master’s style, but he used elements that were foreign to that particular system of martial arts. His angles were tighter, he imposed his own rhythms before breaking them with interrupted timing, and took hits at unexpected spots in a known series. These little changes were devastating to his opponents … as he moved up to the top, to face Kareem Abdul Jabbar. Did you notice in his confrontation with the above-mentioned tall dude, he had to incorporate some of what he had used on the lower levels? It was like the culmination of all of Bruce’s martial skill to be able to defeat such a tall, strong, and swift opponent … with ungodly large hands and feet. The point of the above isn’t to review a movie that could have been better than Enter the Dragon, had it been completed; instead, I want to ask you a few questions? Next question: When you fight someone in your own style, do you use the techniques already familiar to him or her? Last question: If you only had a second or two, could you discover what it will take to control the opponent in front of you, from a different style? In other words, how quick is your analysis of others?